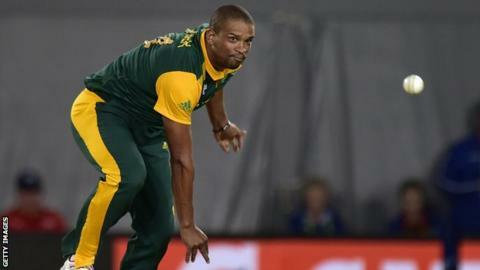 South Africa bowling all-rounder Vernon Philander has said playing for Nottinghamshire is a "great opportunity". Philander will feature in six County Championship and three T20 Blast matches before being replaced by Australian seamer Ben Hilfenhaus. The 29-year-old last played county cricket for Kent in 2014, and has also had spells with Middlesex and Somerset. "I've always enjoyed playing county cricket," he told BBC Radio Nottingham. "It's a format that I love, and I think having this opportunity at the front of the season gives me a great opportunity to come out and exploit these conditions. "I'm just looking forward to it." Philander also said that he is fully recovered from the hamstring injury that forced him to miss three matches of South Africa's run to the World Cup semi-final. He had previously missed the triangular series with Zimbabwe and Australia in August and September 2014 with a similar injury . "I'm all good now," he added. "I've done all the rehab and fitness work to get to where I am today, so I'm ready to go again."